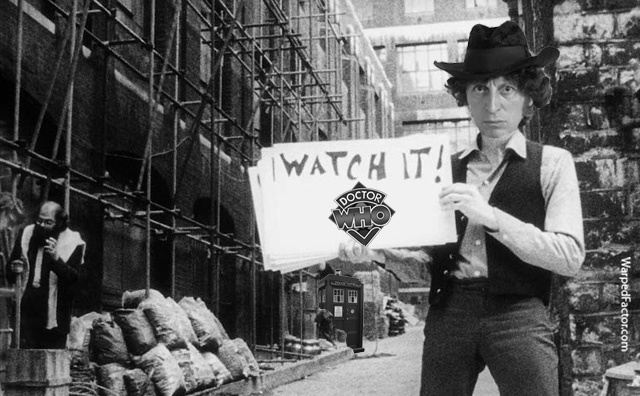 Doctor Who: Subterranean Earthsick Blues | Warped Factor - Words in the Key of Geek. And that man was one Thomas Stewart Baker, aka the Fourth incarnation of the Time Lord. 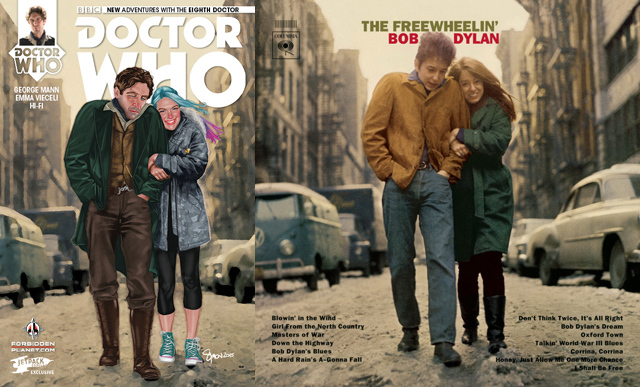 While he may have pondered a David Bowie-ish Pierrot costume soon after his regeneration in Robot, he would eventually opt for a look more in keeping with a young Dylan - see the aforementioned Freewheelin' cover by way of a comparison/contrast exercise. 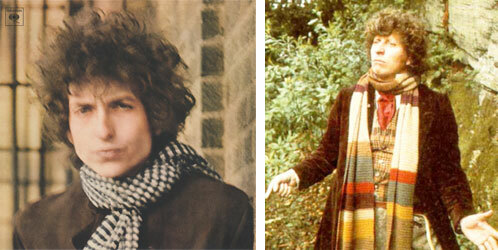 Take a look also at the cover of Blonde On Blonde for perhaps the clincher. Big hair, long scarf, recognisable nose! But is there more to the link between Tom & Bob than just a fashion statement? 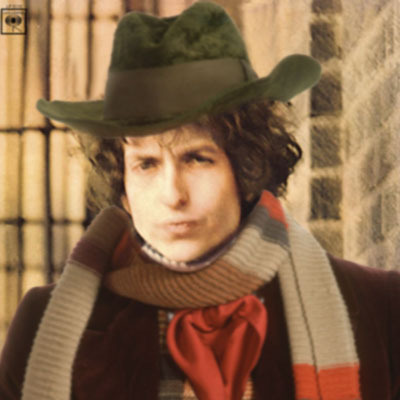 Both share a certain bohemian sensibility, the Doctor's subterranean Earthsick blues quickly apparent. His later self would also rip off Dylan's cue cards idea long after Bob got over blues of his own! Back to the "all teeth & curls" Doctor, who soon got over his own malaise at working for the man. Although it would seem that he & his fashion twin had differing ideas as to what a trip constituted. DOCTOR: We're just going on a little trip. Would you like a jelly baby? HARRY: Little trip? What, in that old police box? DOCTOR: Yes, as a matter of fact, in that old police box. HARRY: Oh, come along now, Doctor. We're both reasonable men. Now, we both know that police boxes don't go careering around all over the place. HARRY: Of course we do. The whole idea's absurd. DOCTOR: Is it? You wouldn't like to step inside a moment? Just to demonstrate that it is all an illusion. HARRY: Well, if you think it'll do any good. DOCTOR: Oh, yes, it'll make me feel a lot better. And no, "jelly baby" isn't street slang for drugs, either! Though narcotics did provide a sort of inspiration for the process by which the man about to dematerialise the TARDIS emerged in the first place, according to a certain school of thought. It would seem LSD - also popularly attributed as an influence on a certain Sgt Pepper album track, which of course features Dylan among the cutouts alongside the Beatles - was in a sense behind the initial concept of the regenerative process first seen as Patrick Troughton's Second Doctor sprang up in place of William Hartnell's First the year before the album's release. Production documents from the BBC's own archives make the connection all the clearer. "It is as if he has had the LSD drug and instead of experiencing the kicks, he has the hell and dank horror which can be its effect." "I'm not sure that I really like his portrayal - I feel the part is exaggerated - whimsical even - I keep expecting him to take a great watch out of his pocket and mutter about being late like Alice's White Rabbit." White Rabbit was of course the title of Jefferson Airplane's 1967 hit, Grace Slick raiding Alice's Adventures In Wonderland for psychedelic imagery. Perhaps a literal case of "Mother, mother, I feel sick. Send for the doctor quick, quick, quick"! "His hair is wild and his clothes look rather worse for wear." And of course a similarly radical change to the transition between Hartnell & Troughton would occur when Jon Pertwee handed over to our Dylanish friend! DOCTOR: I tell you, Brigadier, there's nothing to worry about. The brontosaurus is large and placid. HARRY: This the patient, sir? DOCTOR: And stupid. If the square on the hypotenuse equals the sum of the square on the other two sides, why is a mouse when it spins? Never did know the answer to that one. BENTON: Excuse me, sir. The daily reports. HARRY: Take him to the sick bay. I'll make a proper examination there. BRIGADIER: That, Mister Benton, is the Doctor. BENTON: You mean he's done it again? He's changed? BRIGADIER: Apparently. Saw it happen this time. Lieutenant Sullivan? BRIGADIER: I'm placing the Doctor in your personal charge. He's to have your full attention. Of course, the new regenerative effect as first seen during the change between Christopher Eccleston's Ninth Doctor & David Tennant's Tenth, takes on a whole new set of connotations. "As the centerpiece of the show, The Doctor operates like a monotheistic deity (i.e. Jesus Christ) who possesses incredible power, knowledge, and an uncanny ability to resurrect himself in the face of death. He often travels many miles to spread truth and illuminate the minds of those who are lost. Sometimes, he has to go on his journeys alone, but other times, he needs his faithful companions to spread the word about his goodness and encourage others to trust in his actions (even when they don’t fully understand his ways). He goes where he is needed, calls people who are considered “lesser” to become greater, and displays near-constant compassion toward many characters who don’t deserve his protection. But, although he is loving, he can be filled with a searing rage and will not hesitate to either allow or incite certain events to teach someone a lesson. His legacy is known across the universe, his stories have been told from generation to generation, and there are shrines dedicated to worship his greatness. And, with a name like Time Lord, the messiah-like personality of The Doctor is obvious." And in a further less obvious link Bob Dylan also had a religious phase - becoming a born-again Christian in the late Seventies. Saved & Slow Train Coming showcasing his new faith. "Years ago they.. said I was a prophet. I used to say, "No I'm not a prophet" they say "Yes you are, you're a prophet." I said, "No it's not me." They used to say "You sure are a prophet." They used to convince me I was a prophet. Now I come out and say Jesus Christ is the answer. They say, "Bob Dylan's no prophet." They just can't handle it." And indeed as the Doctor had once angrily remarked "I am not a god!!". But for a while, though, he was a Bob. Sort of?